Join us for a program of Japanese music for koto, bass koto and shamisen. It was composed by Jonoshiga between 1781~ 1789.
children's song of Japan, arranged by Shingo Edo. 6) "Koto, Piano" by Hyo-shin Na. According to legend, the shape of the koto originated from that of a crouching dragon and parts of the instrument are named after the dragon. The koto is roughly six feet long and usually has thirteen strings arched over independently moveable bridges that sit on a hollow body of paulownia wood. The movable bridges are called ji and are made from plastic, ivory or wood. By adjusting these bridges, any thirteen-note scale can be produced, even one with microtonal intervals. In addition to the notes available through the adjustment of the bridges, each pitch can be altered by pushing down the strings with the left hand. Such a movement stretches the string to produce up to a whole step difference in pitch. The instrument has been part of the gagaku court ensemble for over one thousand years, and also became popular among the merchant class of the Edo period (1600-1868). An important member of the traditional sankyoku ensemble, along with the three-strings shamisen and shakuhachi (bamboo flute), the koto developed further in a solo capacity, eventually gaining its place as one of Japan's most prominent instruments. Today a varied repertoire of compositions, along with a wide range of playing techniques providing a wonderful palette of sound textures, make the koto appealing to audiences the world over. A 17-string bass koto was developed early in the 20th century by koto master Michio Miyagi, and this instrument now plays an integral role in contemporary ensembles. The sangen is a three-string long necked lute. The neck extends through the head of the instrument over which skins are stretched in the front and back. There are no frets on the neck, so it easy to make subtle changes in pitch and tone quality through slides and various other techniques. There are numerous traditions of sangen performance, each with a unique sound and repertoire. Neck and head size, shape and size of plectrum and type of lower bridge all vary depending upon genre. Shoko Hikage began playing koto at the age of three. Her first teacher was Chizuga Kimura of the Ikuta-ryu Sokyoku Seigen Kai in Akita Prefecture, Japan. From 1985, she received special training from the 2nd and 3rd IEMOTO Seiga Adachi. In 1988, Hikage graduated from Takasaki College with a major in koto music. She was then accepted as a special research student in Sawai Sokyokuin (Sawai Koto Institute) under Tadao and Kazue Sawai, where she received her master's certificate. In 1992, she moved to Honolulu, Hawaii to teach koto at the Sawai Koto Kai Hawaii and at the University of Hawaii. In 1997, she moved to San Francisco where she continues her performing activities. 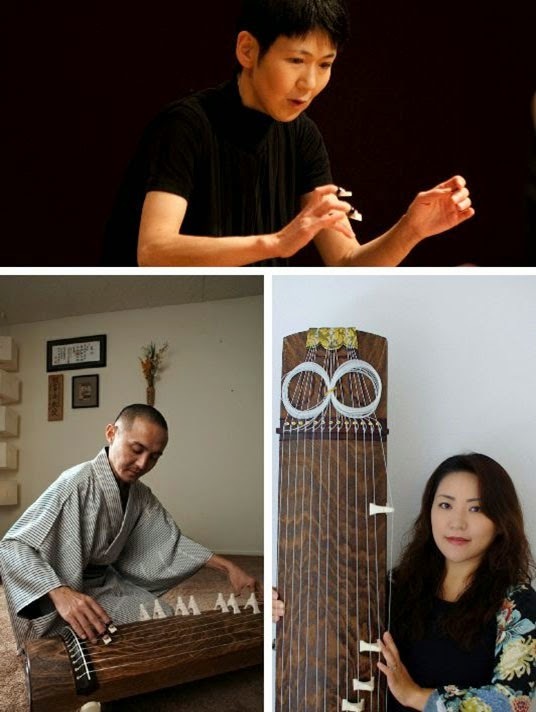 Tomohiro Tanaka (Tara Hills, CA) is a Koto Master certified by Ikuta-ryu Seiha and originally taught by his mother/Koto Grandmaster. He received his Bachelor of Art Degree from Toyo University of Tokyo, Japan. He is a member/founder of Fujin Raijin which collaborates with local musicians in all genres and has performed/videographed in the U.S and Japan. Kayo Toki has studied koto since three years old at Seiha Hogakukai "Seiha Koto School" in Japan. She holds the license of instructor which can teach Koto and Shamisen. She also graduated from the NHK Academy of Japanese Traditional Music in 2002. She is currently playing Koto as a music unit "Fujin-Raijin" in USA.